The Flomenhaft Gallery is proud to present Siona Benjamin's newest and very inspired paintings, photographs and constructions, and with this exhibit we officially welcome her back from a four month trip to India on a Fulbright Fellowship. Like Orpheus, Benjamin has traveled near and far both physically and emotionally before returning to Mumbai, where she was born. Growing up in India she was a member of the Jewish Bene Israel group that settled there at least nine generations ago. As a child she was pulled from her roots of necessity. She was educated in Catholic and Zoroastrian schools because they offered the best education. Ever since, hers has been a voyage of self discovery, to find a way most meaningful to her. Benjamin attended art school in Mumbai, then came to study in America in 1986 where she received two masters degrees, one in painting and the other in theater design, before settling in Montclair, New Jersey. It is hardly surprising that she calls a series of works "Finding Home." The centerpiece of our exhibit is Benjamin's "Magic Carpet." It represents the culmination of her pilgrimage from early childhood to the present day. It hints at a fable she loved as a child about a camel who on a cold night cleverly induces his Arab master to move out of his tent so that he could take his place and keep warm. 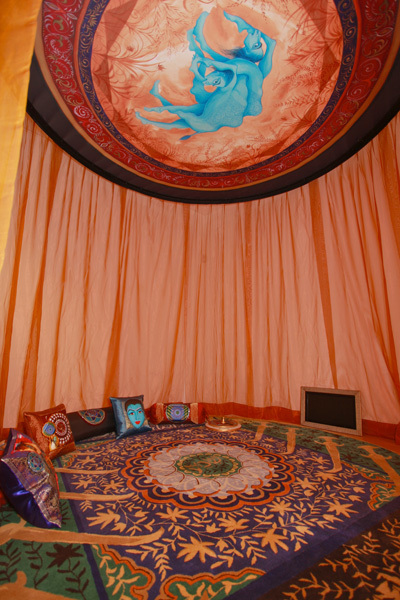 In the Flomenhaft Gallery Benjamin has created a spectacular tent with a carpet woven in India based on one of her paintings. On the ceiling looms the camel. Cushions are strewn about to welcome guests, to make viewers comfortable and ready to share thoughts. Always interested in the plight of the outsider with whom she identifies, her tent installation opens up questions of who belongs in the tent/ or country/ or territory/ and who does not. Another arresting work is based on her Fulbright Fellowship adventure. For the fellowship, she took photographs of about 60 Indian Jews from the Bene Israel community who remain in Mumbai and surrounding areas. She plans for a future show of this project which she will call "Faces: Weaving Indian Jewish Narratives." Benjamin will combine the photos she took with painting using memorabilia relevant to each individual. An example from this series will be ready for our exhibit, in addition to a montage of the portrait photos. In all her paintings there is a unique congruence of ideas that issue directly from her voyage to self knowledge. Persian miniatures cohabit with Hebrew Midrash narratives that are happily united with Pop art.